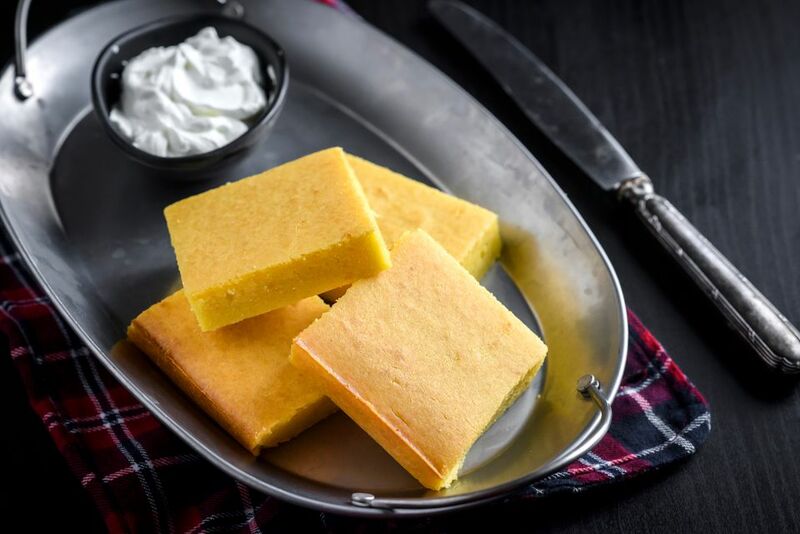 This recipe for Serbian cornbread or Srpska proja was a staple among Serbian peasants and more common than white wheat bread. Today, proja is served warm often with cracklings, yogurt, soft cheese, sauerkraut dishes, kajmak or sarma. Cornmeal is used in various preparations in the Balkans and is seen in Bulgarian kachamak (like polenta) and Romanian mamaliga balls, for example. Heat oven to 375 F. Lightly coat a 13x9-inch pan with cooking spray. In a large bowl, mix cornmeal with salt, butter, eggs, and 1 cup milk until thoroughly mixed, for at least 5 minutes. Add remaining 1 cup milk and mix again for 5 minutes. Transfer to prepared pan and bake until golden and crumbs stick to a toothpick. Cut into squares, but leave in the pan, and bake an additional 5 to 10 minutes, for a total baking time of 50 to 60 minutes. The cornbread should be crusty on all sides. Since this cornbread is on the dryer side, it's ideal to accompany hearty Serbian saucy dishes such as white bean soup or bean stew. This is one of those times when Miss Manners won't mind you sopping up the juices on your plate with a piece of bread.